Members of Speaking Up For Us (SUFU), a statewide self-advocacy network, planted a tree recently at the University of Maine at Presque Isle to celebrate the network’s 20th anniversary. 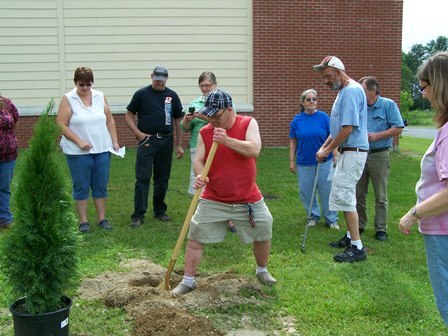 The tree planting took place on July 9 outside of Gentile Hall. Similar tree planting ceremonies in honor of the network are being held throughout the state this year. SUFU members selected Gentile Hall as the location for their tree planting as many of them are frequent visitors to the wellness center and having the tree nearby would give them ample opportunity to watch their tree grow. More than 35 people attended the ceremony. Members of the local SUFU chapter took turns digging the hole for their evergreen tree, offering a dedication, and giving it the first watering. Speaking Up For Us was started in 1993 in Maine and for the past 20 years has been an important part of the lives of people with intellectual disabilities. The network has given members a voice in decisions made about people who live with disabilities. SUFU educates others about their rights, leadership, relationships, alternatives to guardianship, how to organize, vote, get jobs, and other important issues. It also works to educate the community about putting the person, not the disability, first. For more information about SUFU, contact Krista Kennedy at 768-8312.